In this warm salad the dressing is made right in the sauté pan, then the spinach is slightly wilted in the pan. In order to make this dish successfully, you must have every ingredient prepped and organized next to your stove. Success is counted in seconds here. Place the whole beets in a pot and cover with water. Add salt to the water and cook the beets for about 40 minutes or until they are tender. Add water during the cooking when necessary. Rinse the cooked beets under cold water. Peel, then cut in half. Slice the halves about 1/3-inch thick so that they are shaped like half-moons. Pick the stems from the spinach. Wash and drain very well. Check for ladybugs. Cut the bacon slices crosswise into 1-inch pieces. In the sauté pan on medium heat, cook bacon until crisp. Remove the bacon from the pan and place on a plate lined with paper towels to absorb the grease. Pour off half of the fat from the pan and return it to the stove. Add the onions and cook until they begin to become translucent, don't over cook (about 1 minute). Next, add the oil and vinegar along with the beets. Cook gently until the beets are very warm. Season with salt and pepper. Remove the onions and beets with a slotted spoon, leaving the dressing in the pan. Add the spinach and toss continuously using the tongs. 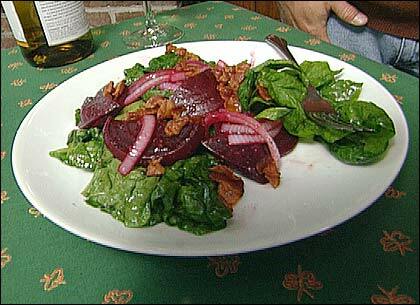 When the spinach is slightly wilted, divide it on plates and put the warm onions and beets on top of the spinach. Sprinkle each plate with the crisp bacon and serve at once. This segment appears in show #3003.